Welcome back to another week of Fantasy baseball waiver wire recommendations. We’re now into late-April, and while there’s still tons of time to make adjustments, by now you’re getting enough data to have a good idea of your team’s strengths and weaknesses. So use that wire, peeps! This week, the Pirates lost Starling Marte for 80 games thanks to a PED suspension, crushing news for his Fantasy owners; Giants’ ace Madison Bumgarner crashed on a dirt bike and will be out for up to two months; and Baltimore, Houston and the Yankees continue to play great baseball, while the Angels and Blue Jays continue to slide. Meanwhile, in the National League, Washington continues to be the beast in the East, the Cubs once again lead the Central, and the surprising Rockies and Diamondbacks are fighting it out in the West. And now let’s get to this week’s waiver wire picks…. 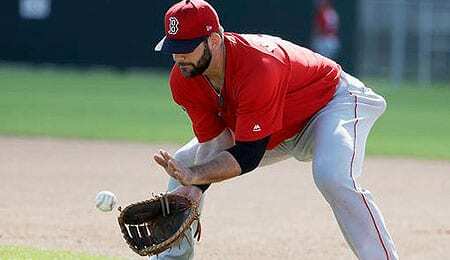 Mitch Moreland, 1B, Boston Red Sox (ESPN: 40.2 per cent; CBS 50 per cent): Moreland has been on a tear lately, batting nearly .400 in the last week (10-for-27), scoring four times and knocking in seven. Moreland also leads the majors in doubles (11), but had only hit one home run this year (see video below) before going yard Sunday. Remember that he smacked 22 long bombs last season. Hector Santiago, SP, Minnesota Twins (ESPN: 13.6 per cent; CBS: 26 per cent): In four starts, the southpaw is 2-1 with a 2.19 ERA and a 0.97 WHIP. On Friday, Santiago pitched his third straight quality start, which matches his total for all of 2016. His next start will be on Wednesday in Texas, normally an unattractive matchup, but the Rangers are struggling right now, ranking just 24th in the bigs in OPS. Robbie Grossman, OF, Minnesota Twins (ESPN: 6.8 per cent; CBS: 9 per cent): Grossman has been tearing it up in the last week for Minnesota, batting nearly .400 (7-for-18) with six walks and four ribbies. The Twins have penciled him in frequently in the second spot, and he seems to be thriving as the designated hitter. Miguel Montero, C, Chicago Cubs (ESPN: 0.8 per cent; CBS: 2 per cent): Montero is in a job-share again this year, but he’s really hitting well when called up. He got a key pinch-hit single on Wednesday to help spark a big comeback win for the Cubs and has now hit safely in five straight games. In a very deep NL-only league or two-catcher format, Montero could be a nice pickup. Bud Norris, RP, Los Angeles Angels (ESPN: 1.3 per cent; CBS: 5 per cent): Norris bagged the save Saturday with closer Cam Bedrosian on the DL. Norris has been a swingman the last couple of years, but as the losses piled up, he’s been wisely converted into a late-inning reliever this year. So far, the transition is paying dividends as he now has a chance to help teams seeking a short-term source of saves. Kolten Wong, 2B, St. Louis Cardinals (ESPN: 4.2 per cent; CBS: 14 per cent): Just like his team, Wong is off to a slow start, but just like the Cards, he seems to be shaking it off now. It started for him on Thursday when he tripled and drove in three runs. On Friday, Wong singled, doubled, scored twice, drove in a run and drew a walk. On Saturday, he got a steal, and then added another on Sunday as he went 2-for-2 with two runs, a ribbie, a double and a walk. Wong had a chance to steal a second base, but was picked off. Still, he’s shaking off the cobwebs and deserves another look for your Fantasy team. Lewis Brinson, OF, Milwaukee Brewers (ESPN: NA; CBS: 24 per cent): It’s time to start the Brinson watch. He’s hit safely in all 10 games at Triple-A, scoring a run per game and batting .395 despite the fact that he’s whiffing once per game. Brinson is going to be a hell of a fielder with speed and power. Milwaukee’s top prospect, and likely a top 20 prospect overall, he has clearly shaken off that dislocated pinkie that sidelined him at the start of the season and will soon be ready to make his MLB debut. Now it’s your turn. Let us know in the comments below who your favourite Fantasy baseball waiver wire pick of the week is. This entry was posted on Sunday, April 23rd, 2017 at 6:41 pm	and is filed under BASEBALL, David Weightman, The Wire Troll. You can follow any responses to this entry through the RSS 2.0 feed. Both comments and pings are currently closed.